In the world of cancer, no one is safe. It does not discriminate. Women, men, and children fall prey to its presence and attack on the human body. So where does this leave your mobile home community? Well, we’d like to think your community could have a place in helping others through their battle with cancer or in preventing cancer. In research on cancer, you’ll read that diet, exercise, and decreasing stress play a large impact in fighting it and staying healthy. While these three things don’t ensure a cancer-free life, they do make a difference. This is important to the overall health of your mobile home park community and the world beyond. By educating and helping your community learn about cancer and cancer prevention, you are doing a good thing in the fight against cancer. 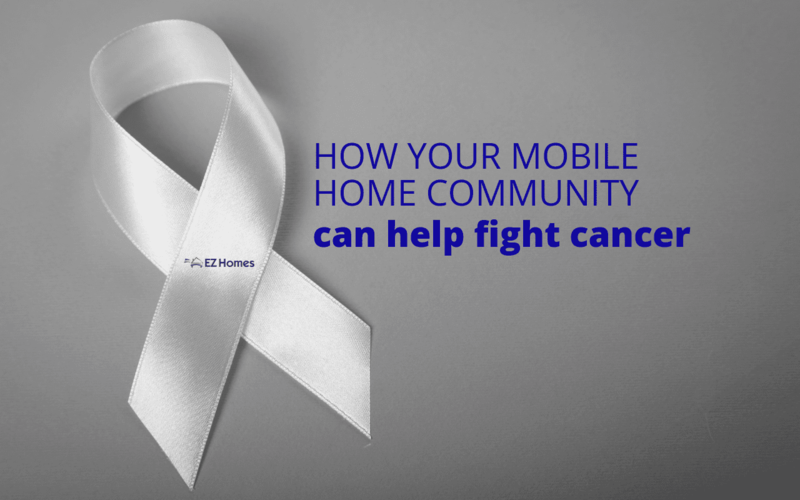 So follow along and we’ll give a few ideas on how your mobile home community can help fight cancer. First on our list are health seminars. You can host health talks in your mobile home community. These education health seminars can be taught by health gurus, doctors, and nutritionists in your town. Think of the possibilities. You could host a series of seminars that span several weeks, one day a week. And such an educational opportunity may be open to the world outside of your community. Education is always the first step to fighting off any problem in life, including cancer. Another idea is to start a community garden for your mobile home park residents. A community garden can inspire residents to eat healthier, thus fighting cancer. Food that is grown in conditions monitored by you can prove to be better for you than what you buy at the grocery store. Give it a try. If a community garden isn’t going to work for your park, think about sending out flyers that advertise your local farmers market to residents. List the benefits of eating veggies to fight against cancer along with the upside to locally grown produce. Alternatively, craft workshops are a great way to relax and do away with stress. Putting your energy into a creative effort can be therapeutic to the anxious and stressed-out individual. Reach out to your local hobby stores, artists, or gardening cooperative. You’ll often find people are more than willing to share their love for a hobby with other people. You can use the workshop as a springboard to discuss the importance of warding off stress in fighting cancer. Here’s an idea — an onsite gym, whether indoor or outdoor, could spur your residents to workout regularly. Exercise is good for the mind, soul, and body in mitigating the opportunity for cancer to set in. To help your community, reach out to local hospitals and see about cancer screening information that you can send to your residents. Sharing this informative information as part of your community newsletter or simply sending it out in an email or delivery to their doorstep could play a big part in educating your community. Finally, consider hosting a community-wide fundraiser for cancer research. This fundraiser can take the form of a bake sale, a community-wide yard sale, or even a car wash. The sky’s the limit in how you can raise funds as a community. Decide on a cancer research endeavor and pull together a plan for the fundraiser. After the fundraiser is over, send the collected funds to the entity you settled on. It’ll feel good to invest in a worthy cause. As we said earlier, cancer does not discriminate against race, age, or gender. To those who’ve experienced cancer personally or watched a loved one suffer through it, there are no words to say just how we feel for you. We hope the ideas shared here will shed a little light on a problem that is affecting the world. Looking to do good in your community? We have 9 ways your mobile home park can partner with your local community.